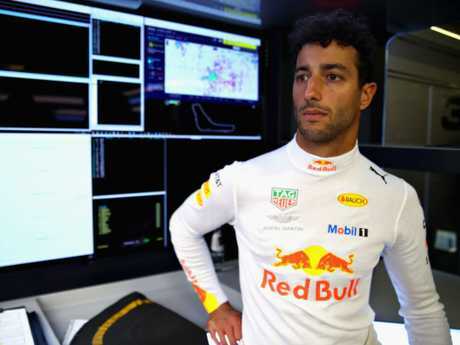 THE tension between Daniel Ricciardo's current and future Formula One outfits continued as he limped out of another grand prix. The Australian exited Sunday night's race in Italy - won in stunning fashion by Lewis Hamilton - on the 25th lap after an apparent engine failure. As smoke poured out of the air intake of Ricciardo's car, fingers were pointed at engine provider Renault for another shoddy job. But Renault, the team Ricciardo will drive for in 2019, was quick to make it clear they were blame-free tweeting: "His retirement was not linked to the engine. It was rather a clutch issue." Ricciardo started from 15th on the grid after taking a penalty for using a new engine. He made up ground early in the race before being forced out for the fourth time in six races. "It's been another frustrating race for me," Ricciardo said. "I passed (Lance) Stroll and looked in the mirror to see if I was clear of him but I couldn't see that well. I then realised that was because there was a lot of smoke coming out the back of the car and when I reported it to my engineers they asked me to stop. "I feared it could have been something to do with the power unit but after we got the car back to the garage and the guys investigated, they suspect it's a clutch issue. It's been a frustrating period of races but hopefully we can change some things on the car, improve the reliability and aim for the podium in Singapore." 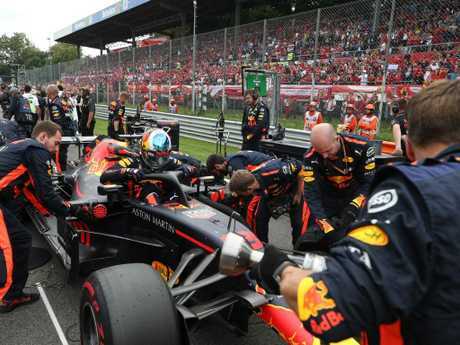 Red Bull teammate Max Verstappen fared better but was also in a frustrated mood post-race after being hit with a five-second penalty for causing a collision with Mercedes' Valterri Bottas. It saw him drop from third place to fifth. "I think if you look at the car performance, we've done a really good job in being that competitive on this track today. I don't think it could have been better for us and finishing third on the road was a good result," Verstappen said. "Unfortunately we had a penalty and I was put back to fifth. I think I gave Valtteri enough space on the left so he didn't need to go off the track. 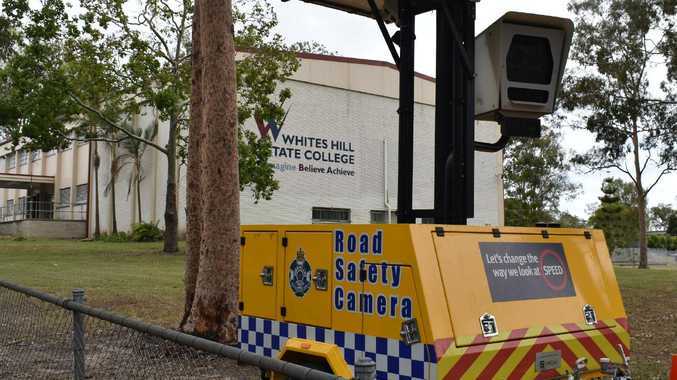 "The rule says that as long as you give the other driver a car width space, it should be enough. That's what I did, but he clipped my wheel at Turn 1 and he had to go straight on. "I don't agree with the penalty, but the decision is taken and we can't do anything about it. Of course after I heard about the penalty I was even more determined to keep my track position. I've tried to do the best race I could and I had to fight hard for it as we are so much slower on the straights. "Before the race I thought fifth would have been the best possible result for us, but after a good start and keeping the Mercedes behind, we were in third position, so I gave it everything. "Looking at the positives, the car was performing very well today and in terms of pace we were competitive. In general keeping a Mercedes behind you on this track is a very positive sign and hopefully we can keep this momentum going to Singapore where our car is usually strong." 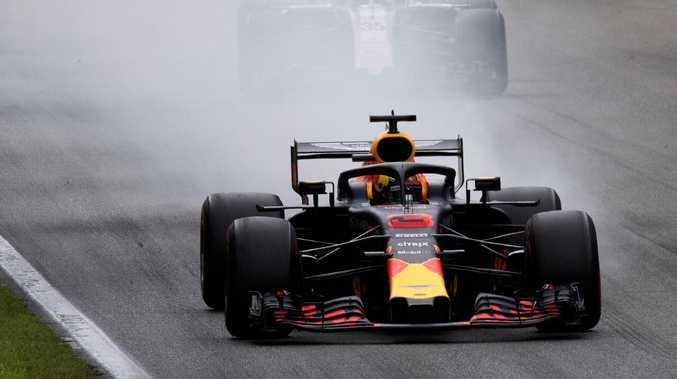 Red Bull Team Principal Christian Horner admitted Verstappen was "shocked" to hear Ricciardo was leaving the team after the Aussie announced a surprising move to Renault for the 2019 season. Verstappen will be Red Bull's No. 1 driver as Pierre Gasly slots into Ricciardo's old spot at the team. "He was shocked and asked 'why would he do that?'" Horner said in the pits before the race. "They've had a good relationship and I really think he'll be sad to see him go."